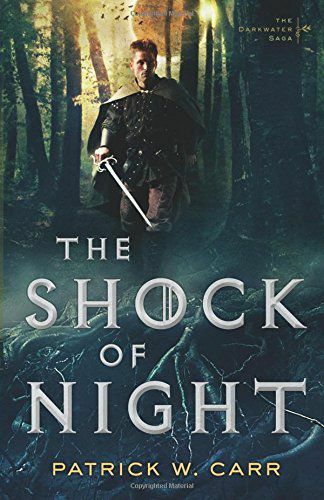 Patrick W. Carr’s ‘The Shock of Night’ is a good example of fantasy for the educated adult. d A nice relief from all the YA children’s fantasy and all the fantasy written for people who were victims of the public school mis-education system. When my copy of the book arrived, I wasn’t that eager to begin. I had been binge-reading some starship-based sci-fi and was in the mood for more along that line, if I could find it and afford it. And the small print in this book was hard on my eyes, particularly since I don’t have a well-illuminated reading chair any more. The lamp that my parents bought some 50 years ago has finally died and I haven’t found anything to replace it with. I opened up the book to find the story is sort of a mystery set in a richly detailed medievalish fantasy world. The Church in that world is not a copy of the medieval Catholic church, nor of Protestant impressions of what the medieval Catholic church was like, but its own thing and quite distinct from any generic fantasy world Church or religion. It began well. But since my copy of the book is in one town and I am in another, I won’t get a chance to finish it and review it until tomorrow. The US government would like me to say that I got a review copy for free in exchange for participating in this blog tour but because I have the Constitutional right of free speech I absolutely refuse to say that because the fact that I got a free review copy is none of anyone’s business so if anyone asks you, you didn’t hear it from me. Author Website – http://www.patrickwcarr.com/Blog tour participants. Nissa Annakindt from this blog, right here. 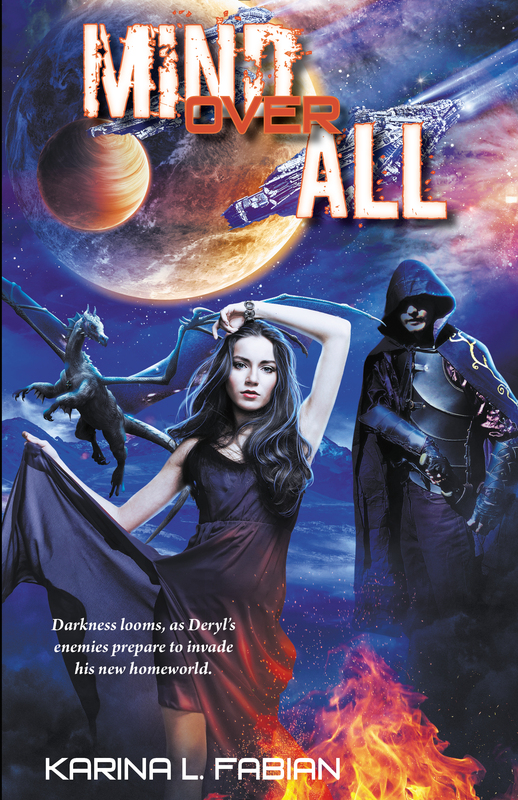 Guest Post by Karina L. Fabian, author of Mind over All. Like Nissa, I’m a cat person. For 19 years, we had a calico named Elbereth. My husband named her for the Queen of the Elves because she had pointed ears and attitude. Of course, the reason we got her was because she came into the house one day, uninvited, crawled onto Rob’s chest, and purred while doing the happy claws thing. She may have had attitude, but she also knew whom to schmooze. Elbie was a military cat, meaning she traveled with us as we moved from state to state for my husband’s Air Force career. She lived in seven states in the course of her lifetime. In Wyoming, she was an indoor-outdoor cat. Despite being declawed in the front, she could still climb trees and scale a six-foot fence. In Colorado, we lived in the prairie, so she had to stay indoors for fear coyotes would get her. In Rhode Island, she was an apartment cat. This past year, she’s lived in two rooms of the house, plus the garage, thanks to a cat-chasing dog and the fact that she was getting incontinent. She’s dealt with four kids and five dogs. When she was a kitten, she would entice the kids to chase her, even whacking them if they got distracted. However, if she wanted to be left alone, she’d escape to the plant shelves above the doors. We never had plants up there, just space for her. She never got along with the dogs, though she managed a detente with most. Our latest, Marley, however, thought she should be his personal chew toy. More than once, he’d caught her and scared me half to death. 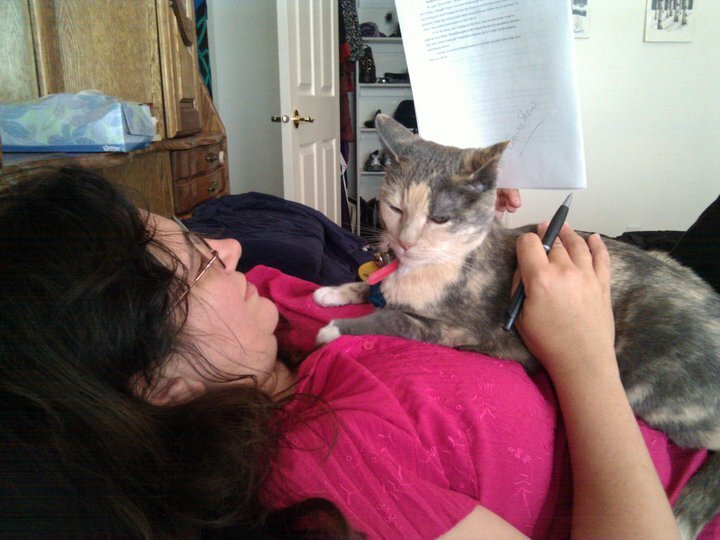 Always, she was a writer’s cat. She used to sit in my lap when I wrote, relax behind the screens when it was chilly, or hang out under the desk when it was warm. I had a pillow just for her on my desk, but when she was spry, she preferred the back of my chair. If I laid down to work on editing paper copies or to write on my laptop, she settled on my chest or my hip, making sure I didn’t move until I had gotten some work done. She was with me when I started my first novel, Mind Over Mind, and she was with me when I finished that trilogy, Mind Over All. She’s also been there for the intervening books, articles and stories, sometimes watching over me, sometimes nudging me to give her the attention she deserved. July 17th, I came home early intending to work on the book tour for Mind Over All. Elbie took a few steps toward me and collapsed. She spent the next few hours in my lap, too weak to move while I alternated between typing, petting her and watching her breathe. Finally, with restless motions, she told me she wanted to lie on the floor. She crawled under my desk and about an hour later, died there, in her favorite spot, listening to the sound of the keyboard clicks. I’ll miss my kitty, but I’m thankful for the time we had together. She was truly a writer’s cat. When two planets are set to collide, Deryl must use his psychic powers to stop Armageddon and save his home. Hi! It’s Nissa. I’m really grateful to Karina for contributing a guest post to this blog. I have not read Mind Over All yet, but have read the first book in the series, Mind Over Mind, and enjoyed it. I’ve also loved her Neeta Lyffe Zombie Exterminator series and the DragonEye P.I. series which features Vern, a private eye character similar to Sam Spade, except Vern’s a dragon. 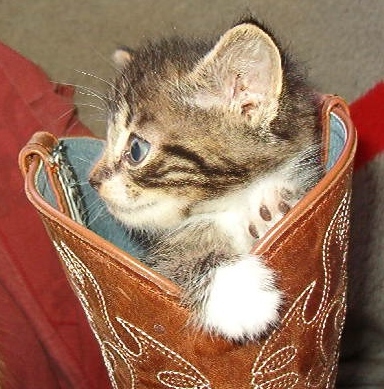 And in case any readers thought Karina’s cat story was a bit too sad, here is a picture of a kitten in a boot. This kitten’s name is Little Stranger since his birth mother abandoned him and he was raised by another mother cat who had 5 tortoiseshell kittens (all girls). Little Stranger is now a grown up tomcat. Poetic excerpt from Tanith Lee’s ‘The Silver Metal Lover’. I must confess, I was never a Tanith Lee fan. I’ve always been a picky reader and tend to stick to authors I know until I’ve read everything. But I might have become a fan of Tanith’s. I know she was on a list of authors to read if you like Marion Zimmer Bradley (which I do, obsessively), and I’ve recently discovered that she wrote lesbian fiction under the name Esther Garber, even though she wasn’t a lesbian. At one time, when I was not a Christian, I read quite a bit of lesbian fiction. 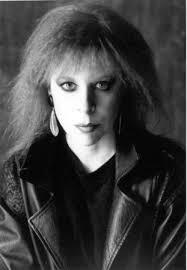 So I could have been a Tanith Lee fan— and perhaps I still will become one, once I start reading her work. I found out about Tanith Lee’s death from a post at Poet’s United. According to Rosemary Nissen-Wade, who wrote the post, Tanith Lee was a poet but her work was hard to find online. She has poems scattered throughout her books. I don’t know if Lee ever published a book of her poetry or whether her poems were published in poetry journals or science-fiction/fantasy magazines that publish poems. But I believe that even if her poems were only published embedded in her fiction, she is still a poet. 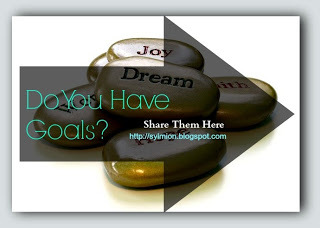 This is a post for the ‘Do You Have Goals’ bloghop. Goals. This is the day I’m supposed to talk about my writing goals and pretend I’m making progress toward them. Or some such. But this is not a good time for that. You see, there’s winter. Which we wouldn’t have right now if they had listened to my advice and barbequed the groundhog for a Superbowl snack. And then there’s the kitten thing. My favorite kitten, Therese, died recently. 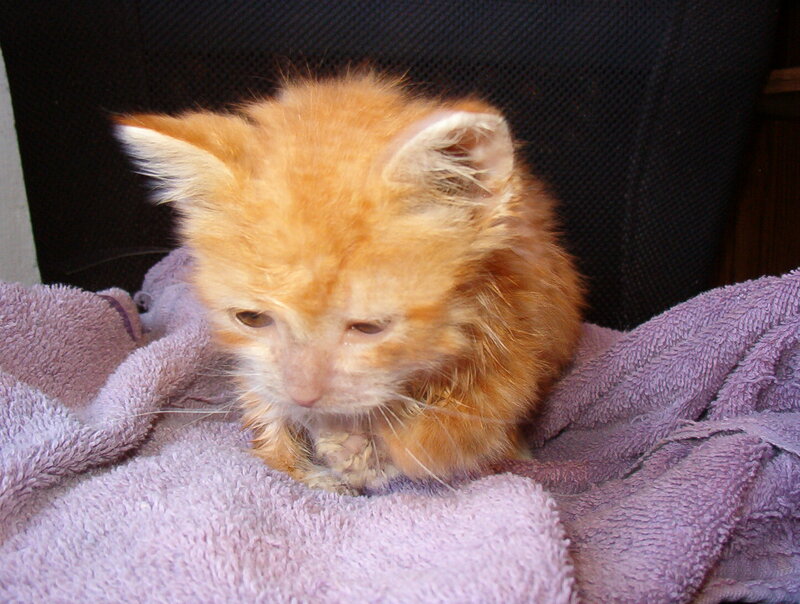 Not a big surprise, she was a dwarf kitten with loads of health problems. But it’s harder to get used to her being gone since I’m so used to checking on her constantly to make sure she was safe and well-fed. And then there are my current health problems including hurting my back bad enough that for several days I was counting the minutes until I could take another dose of aspirin. I have enough writing problems when I don’t have all these other things bringing me down. Talking about my goals would just make me wonder: what’s the point? I mean, I always used to think becoming a published novelist would be a way to stay off government handout programs, but now I’m on disability and Medicaid and food stamps and I’m pretty well trapped. And after so many writing failures I don’t much want to think about the odds of my overcoming my writing blocks to become a productive, commercially viable writer. So I shall think about something else instead. Like: Jews! Why, in fantasy fiction, are there fantasy-world religions that are really Christianity (both by Christian and anti-Christian writers), and religions that are really Wicca/paganism, and religions that are really Satanic/Antichrist religions, but no fantasy world Jews. Couldn’t Shmuel slay dragons just as well as Erick the Untidy? Or: recorders. Fantasy worlds are big on harps, lutes and gitterns (faux guitars, is my guess), but never recorders. And, hey, how about this? Recorders are made of wood. Magic wands are made of wood. How about recorders that work as magic wands? But only if you play the right tunes, Or recorders that summon dragons— why not? When I practiced my new garklein recorder for the first time, it summoned two of my cats right into my lap. And most dragons I know have cat-like qualities. Well, at least Vern does. And Bridger. And Bridger’s sister…. I think I am definitely cheering myself up slightly. Perhaps I really shall write a fantasy tale, about the time Shmuel Ragan defied the king’s law and hired three musicians to play music for his daughter Tziporah’s wedding. And one of them was the Whistling girl, who could summon dragons when she played her garklein recorder, whether she wanted them or not. And how the king’s Heraldic Knights burst in on the wedding reception and carried the three musicians off to the capital…..
Perhaps I shall. Or not. But I think it’s good for my mental health to believe that I shall. In spite of evidence to the contrary.